Although yard furniture can be pretty expensive, the raw materials to make them are extremely cheap, making building yard furniture an excellent choice for craftsmen and women. If the word "craftsman" deters you from even considering a project, don't worry-there are plenty of very simple plans for lawn furniture that you can purchase online (or get for free!) that will break the job down into easy steps. Not only will you appreciate the furniture that you made with your own hands (not to mention the money you'll have saved), you'll also enjoy the endless customizability of doing the job on your own. Building yard furniture can be a fun project to try on your own, or a great family affair on spring afternoons. Whatever the reason you choose to build your own lawn furniture, there are a few things you should bear in mind. Before you begin the project, take a look at the cost of lawn furniture similar to what you'd like to make. Octagonal table sets, Adirondack chairs, and patio tables can cost hundreds of dollars each. No matter what materials you use, you're certain to save money on your project by doing it yourself. However, this is not to say you should buy the most expensive lumber and paint that you can find. You should instead look at the form and function of your yard furniture and determine from that point what materials you should purchase. For instance, pine is beautiful and easy to work with, but it will not wear as gracefully in the weather as something stronger like cedar will. Instead of using fancy joints to hold your furniture together, screws will probably stand the test of time better in the outdoors, especially ones that are resistant to corrosion. If you decide to pain instead of stain your furniture, choose a type of paint that can withstand weather-indoor paint simply won't do the trick. While obtaining a set of easy-to-follow instructions will be a key to your lawn furniture success, don't assume if you're an amateur that you're capable of any job. 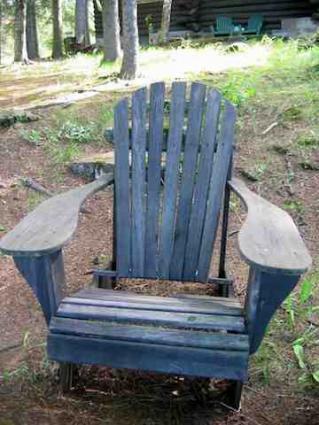 An Adirondack chair, for example, is a beautiful piece of work, but the curves that you'll have to cut might be beyond your ability as a carpenter. Similarly, an octagonal table set, which looks like a massive undertaking, will require only straight and angle cuts. The project may be bigger, but the amount of craftsmanship needed to complete the job is less demanding. Budget out your time in such a manner as to be able to complete the work within your desired schedule. Some plans that you'll find will map out how long the project is expected to take. Pay attention to whether the plans you find or purchase say "beginning," "intermediate," or "expert." In the thick of the building process, you'll certainly be glad that you did! Finally, you will need to come up with a set of plans to build the furniture that you desire. Plenty of these can be found for free on the Internet, and you won't have to look hard before you find plans with different variations on the pieces of furniture that you're considering making. For example, you can browse plans at Drill Bits Plus, Woodworking Plans 4 Free and Wood Worker's Workshop. Take a close look at each of the sets of plans and pick out which one is best for your needs. If you don't find exactly what you're looking for online, you can always purchase a set of plans for a few dollars. Purchasing a set of plans is often a superior option because, in addition to listing the materials you'll need and the cuts you will have to make, they will also usually contain a full-sized set of traceable plans so you can cut each piece exactly to scale without any guesswork. Read through the plans fully before beginning, and you'll be ready to start building yard furniture on your own!